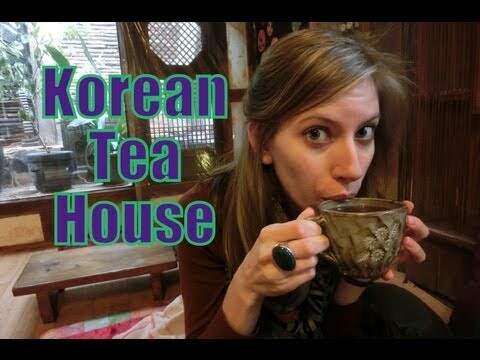 On a cold winter day in Korea we headed to cozy little Traditional Korean Tea House (찻집) in the historic neighborhood of Insadong (Seoul, Korea) to warm up by sipping on Korean tea (specially Ginger 생강차 & Plum 매실차) on a warm ondul floor in a room elaborately decorated with Korean traditional ornaments. We enjoyed the quiet reprieve away from the bustling Insadong main strip where tourists and locals collide in mass. Most Korean tea houses in Insadong are along back-alleys and side-streets just off of the main pedestrian strip in Insadong. You’ll notice these Korea tea houses by their traditional Korean architecture. A proper Korean tea house ceremony is one in which you’re sitting down on a heated floor. Aside from enjoying a hearty Korean soup, sipping on warm tea and enjoying a small bite of Korean rice cakes is the perfect way to remain toasty when it is subzero temperatures outside. We enjoyed the sweet teas and delicious snacks provided by our host. One of rice cake snacks appeared to be coated with honey and was quite airy and light inside. The other rice cake snack, was really dense and chewy. It certainly was a nice contrast between the two different varieties on offers. To stay nice and toasty, we were heated from both an electric fan from above and from the warm ground below (known in Korean as Ondol). Ondol heating is the most common in Korea; pipes underground are heated making the warm floor a very hospitable for lying down or lounging. In fact, we got some comfortable at times we nearly drifted off to sleep. It would have been the perfect place to take an afternoon nap. Overall, our drinks and snacks cost 12,000W (roughly $12 USD) which we feel is much better value that a visiting a typical Korean coffee shop.